TOFU MOM . . . and gravy! : Vegan Ranch Dressing! Supper was simple and boring tonight, but it's probably one of my kids' all-time favorites. 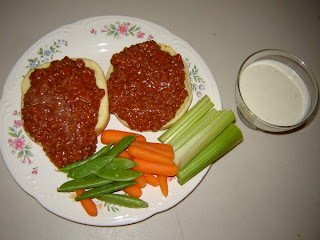 Sloppy Joes, which I can make blindfolded, and a HUGE bunch of fresh veggies dipped in ranch dressing. The Sprouts and I could live on veggies and ranch, I swear. BV (Before Veganism) we were all HUGE Ranch Dressing addicts - almost harder to give up than cheese - and it's taken me many trials to find the exact recipe combination that tasted "ranch-y" and tangy and creamy enough for all of us. Here ya go... (Oh, and I'll post the Sloppy Joes another Day). Use an immersion blender to combine all ingredients, or shake in a jar with tight-fitting lid. Chill for an hour or so to thicken and blend flavors. Looks yummy! I can see this becoming one of my favorite dressings! I'll have to try this. My husband is a ranch fiend. Mmm...I'd like to try this. Do you know how longs it keeps for? It would take me a while to get through 2 cups of it and I wouldn't want to waste it. Well, I'd been "ranch-less" for three years by the time I came up with this, so there is no guarantee that it's authentic... it just SEEMED like it was. It is "greener" than store bought ranch which my kids were a little concerned with at first. Honestly, I have no idea how long it keeps, I'm embarrassed to tell you how fast we go through it. It will keep a week, I know. It starts to separate a little - not in a spoiled way (oh, I'm REALLY making it sound appetizing now! ), but if you stir it, it's fine. oh i must try it! I miss ranch dressing sometimes! Usually, I'm a vinaigrette type person, but sometimes, you just want to dip the darn things in ranch dressing! I know this is an old post but I just stumbled across your blog and this recipe frantically searching for something for my picky visiting omni family. They loved it. I love it. Finally after 3+ years of searching for a good ranch replacement I've found it! Thanks so much!